We had such a good time making this toilet paper craft snowman. My daughter did most of the work herself. I showed her how to pull apart the cotton balls. She operated the glue stick and stuck on the cotton. We talked about how a face looks and she put on the eyes and nose. This fun kids craft now adorns a table. Crafting with your preschooler gives wonderful opportunities for learning as well as developing language skills. Not to mention the memories your making for your family. Be sure to check out the teaching tips following this free kids craft idea. Remember let your preschooler participate as much as possible. This helps them develop creativity and problem solving skills. As you can see, our snowman toilet paper tube project picture is what my 2 1/2 year-old produced. I guided a little, but she did the gluing. Most of our project pictures are child produced so you have a better idea of what to expect. 1. 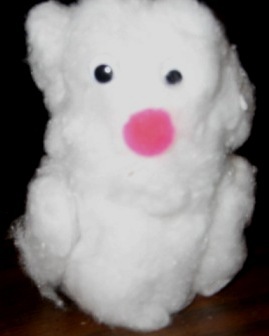 We did this project during a snow storm and we compared cotton and snow. 2. Talk about soft, white, cold. 3. Talk about the parts of a face and where they go. Have your child point to their eyes, nose, mouth, etc.